It was not until 1950 that Estero Blvd. extended the entire length of the island, from the north point to the south point at Big Carlos Pass on Ft. Myers Beach. The pass was named after "Carlos", believed to be the paramount Calusa chief who lived on nearby Mound Key in the 1500's. In 1951, "Laguna Shores" subdivision was being developed on the south point as the large natural lagoon was dredged with connecting canals, forever dividing this parcel of land which once belonged to the Koreshan Unity, as seen in the foreground below. 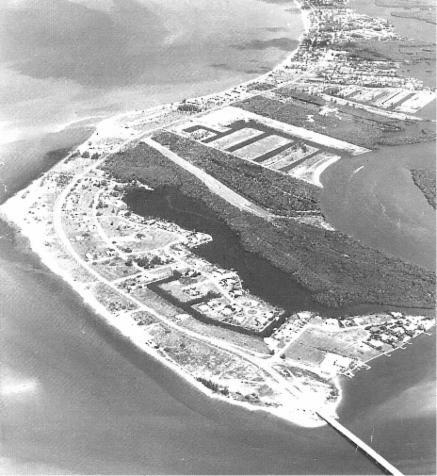 On July 4, 1965, the newly completed South drawbridge connected the South point to the Black Island Causeway with bridges to Bonita Beach. 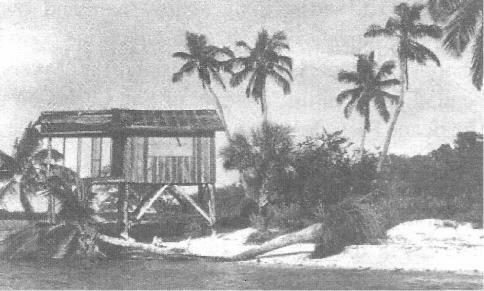 Across Big Carlos Pass during the early 1940's, OscarLybass built "the Nuggett" as a fishing shack for the Heath sisters as seen below after the 1944 Hurricane damage. Their view of Ft. Myers Beach mirrored their Black Island shoreline, with sandy white beaches tangled with mangroves, palms, scrub oaks, Spanish bayonets, slash pines and sabal palms. "The Nuggett" washed away in the no name storms of the 1950's. Today it is the site of "Flippers Restaurant" and condos at the foot of the drawbridge on Black Island. This pass was known for the exciting sport of catching sharks, drum and tarpon for the islands' anglers. Today the bridge gets a lot of foot traffic with fishermen and their bait buckets, hoping to get in on the action. 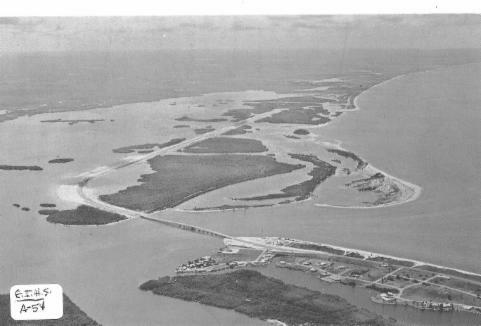 On Ft. Myers Beach, the new bridge marked the beginning of a passageway that changed the pace of the island to a bustling resort community with the two way flow of traffic increased from both ends of the island. With the additional development of subdivisions, canals, shopping centers and restaurants as seen here looking north, it soon became evident that boat traffic was also increasing. The drawbridge is in the midst of it all, with a breathtaking view!